The first result from a Northwest player from the 2018 World Series of Poker is in! Bellevue’s Noah Bronstein min-cashed Event #2 $10,000 NLHE Super Turbo Bounty, a one-day bracelet event that drew 243 entries. 37 players cashed, Bronstein came in 28th. Typically, a high five-figure cash would be more than enough to make the leaderboard, but I was a bit conflicted on this one, because Seth Davies (Bend) was playing the Super High Roller Bowl in the PokerGO Studios at Aria where the buyin was $300K. He bubbled the event but picked up three $30K deposits from players who didn’t show up. Last update before the WSOP! I’ll post results from the various Las Vegas series as fast as I can get to them, but it’s not going to match PNW_WSOP_15 when I had the time to track down results that hadn’t been reported to Hendon Mob yet. I’ve got a life now. Just booked a weekend trip June 8. First time to Vegas for 2018, going to play @wsop satellites and survivor @VenetianPoker and harass poker media. No new names on the leaderboard this week, but there is an unfamiliar name at the top of the big money winners: Aaron Ogus. Ogus has only eight previous cashes in nearly fifteen years on his record, with half of them between 2003 and 2006 and the other four in 2013 and 2014. Presumably that’s because the Redmond-based Ogus is too busy managing and inventing stuff at Microsoft to play a lot of tournaments. But after nearly four years without a recorded cash, Ogus strikes big by entering the $25,000 WPT Bellagio High Roller and getting heads-up with Tom Marchese (in a field containing Jake Schindler, Ankush Mandavia, Rainer Kempe, and Anthony Zinno, among others) for a cash that dwarfs not only his previous lifetime winnings but also jumps him from 483rd on the leaderboard to 76th. Calvin Lee (Mercer Island) continues to crush in Korea, with two more big cashes at the All Japan Poker Championship (AJPC) with a 4th place in the KRW10M Super High Roller (that’s about a $10,000 buyin) and a win in the 10-player KRW20M Special High Roller. Vancouver’s Almedin Imsirovic continues his great year, with a 2nd place finish at an Aria $10,500 buyin event, losing to the aforementioned Jake Schindler. Lewiston’s Stephen Schumacher busted me out of the Wildhorse Spring Round Up High Roller by rivering a flush against my set of aces and getting me to call off my stack (stupid Mutant!) but he’s apparently found some other suckers, because in addition to cashing that event and three others, he pulled off a win at the Colorado Poker Championship Main Event. Dylan Wilkerson is closing in on 20 cashes for 2018 already, and he notched a 3rd place in an event at the WPT Bellagio Elite Poker Championship, and 9th out of 600 entries in the opening event for this year’s Venetian Deepstack Championship $100K GTD. Kennewick’s Mohammed Quorban Mirza has cashed in two Venetian events already, as part of a 6-way deal in Event #10 $25K GTD Rebuy and a 2-way chop in Event #16 $40K GTD SuperStack, his largest cash to date. 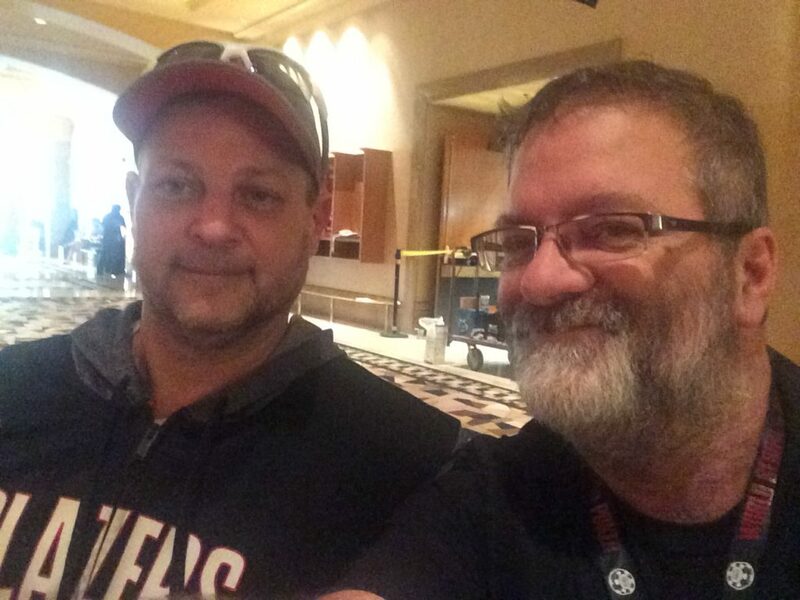 Friend of the blog Wayne Keller (Vancouver, on the left in this picture from 2016) makes the list by taking 2nd in an even 3-way chop in the WPT Bellagio Elite Poker Championship Seniors tournament. If you haven’t checked out Kenny Hallaert’s spreadsheet (linked from the calendar page, as usual), do that, but you might also want to look at @oco’s Vegas Poker Schedule, an interactive tool that has a different approach to winnowing out the stuff you want to find. Let me burn this in to your brain before you go to sleep. It’s co-host of The Chip Race poker podcast David Lappin and the after-hours party last weekend at Unibet Open Malta. Trust me, the podcast is better than the “dancing.” Then again, what wouldn’t be? My father was a union shop steward and local president when I was a kid, and about the time I went to college, he moved on to a job with the union as an organizer, eventually finishing his career after more than a decade as the top official of his union in the state. So I grew up in a union household. We never had a car that wasn’t American-made. I’ve worked for myself for most of my career, and I’ve never been a union member myself (except for a very brief stint at Fred Meyer where I got to fill out all the paperwork but didn’t last long enough to get to the point where I was an actual member of the bargaining unit) but I’ve never crossed a picket line. It was with some dismay that the day after I booked a weekend trip to play some satellites at the World Series of Poker, I heard of the citywide strike called for 1 June by the Culinary and Bartenders Union in a tweet from Kevin Mathers. There’s a list on the union site of the 30+ casinos and hotels that will be affected by the strike if it happens. What won’t be directly affected is the Rio All-Suite Hotel & Casino, the site of the WSOP. According to vegastravelalert.org, the info website of the union, the contract at the Rio doesn’t expire until a couple of weeks after the end of the WSOP, although the rest of the Caesars properties are affected by the 1 June deadline. Luckily—since I only had a couple of days on this trip and I wanted to maximize my time—I’d booked my accommodations at the Rio for the first time ever. So no picket-crossing me. I’m getting in on Friday evening (the 8th), hoping to jump into the 8pm $575 Mega Satellite (pays $5K in lammers and $50 cash), then Saturday and Sunday’s 9am $185 Mega Satellite (pays 3 $500 lammers and $100 cash), with the Venetian 7:05pm $40K GTD Survivor ($400 entry, pays $3,400 cash), and some Omaha Hi-Low cash games at the Rio, Venetian, or Orleans to fill in the time before I fly back out late Sunday. The first big events of the Las Vegas summer poker season are wrapping up this week, so it’s time for one last brief leaderboard update. The only five-figure result I’ve seen from a Pacific Northwest player the past week-and-a-half was from Idaho’s Kevin MacPhee, who made the final table of the WPT Bellagio Elite Poker Championship with 126 entries at $10K each. More numbers should start rolling in by next week. In addition to the Venetian Deepstack Extravaganza III, which started on Monday, the WPT/Aria Bobby Baldwin Classic got under way yesterday, and the Planet Hollywood GOLIATH series starts next Thursday. Just 11 days to the start of the World Series of Poker. Good luck everyone. You may remember MutantPoker readers managed to get Red’s moment in the sun voted as Poker Update’s “Most Memorable Televised Poker Hand of All Time”. Have a great poker weekend! Click the boomplayer link. If you'd said you got all in pre 4-handed with ATo and had 64% equity, I'd say "I think that's impossible." What a bizarre hand! One of the cool things about weeks when there’s not a whole lot going on is a name that you haven’t run across before pops to the front. The fact that there hadn’t been anything big in the last week meant that Washington state’s Kindah Sakkal (#125 on the overall PNW leaderboard this week, and #73 in Washington) was the only name that got picked out of the hat by the magic algorithm. Sakkal’s had a nice run on the WSOP Circuit leading into the summer. Nothing huge by itself, but four final tables in Circuit Ring events in 2018 so far, with two at Thunder Valley, one at Planet Hollywood, and another in Baltimore (just the last day of April), along with three other Circuit cashes. 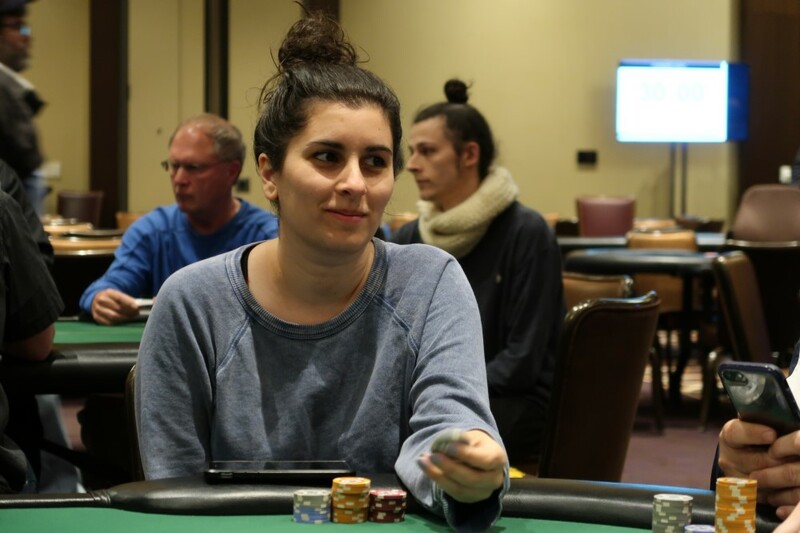 Sakkal finished 4th in the massive 1,022-entry WSOPC Main Event in Cherokee, North Carolina last summer, her best recorded tournament cash to date; more than two-thirds of her 38 recorded cashes (all in the last four years) have been n WSOP/WSOPC events. Results for the Wildhorse Spring Poker Round Up are in the Hendon Mob database, so it’s time to do a little update of the leaderboard. It’s been a month since the last real update, and in addition to Wildhorse, there’s been a fair amount of action for Northwest players outside of Northwest venues. First, though, a couple of words about how the sausage gets made. I compile this info from Hendon Mob’s state-level leader boards by looking for differences in the “money won” numbers from week to week. I check Oregon, Washington, and Idaho. I’d include British Columbia if I could, but Hendon Mob doesn’t break Canadian provinces out separately like they do for states in the US. I only track players with $3K or more of reported earnings on the leaderboard. The Hendon Mob leaderboard doesn’t track recurring or daily tournaments. And because this is all just the Poker Mutant doing all the work for free, I can’t highlight everyone in my write-ups or every cash, much as I might want to. If you’ve been following along for a while, you might notice that while I link to the Hendon Mob payout pages (or direct sources), I don’t typically list the amount won. That’s because casino’s don’t usually report the results of a deal. Some do, but I know, for instance, that the Wildhorse Main Event had a 3-way deal, but the figures reported to Hendon Mob don’t reflect that. So like all ranking systems, nothing here is completely accurate, but it’s fun all the same, no? Almost as if to prove my point, let’s start with the bogus entry in the players who are just breaking the $3K barrier that keeps the riff-raff oout of the leaderboard. This guy had just $1,300 in winnings before he took 2nd place in the 402-entry Thursday tournament at Wildhorse, but Vancouver’s Bill Patten also has another 2nd place at Wildhorse from last year as William Patten (no relation to Vince van), and he’s been on the leaderboard for a while. So not really a newbie. No idea whether Shane Stonemetz from Zillah, Washington has another identity (there aren’t any other Stonemetzes on Hendon Mob), but he had a breakout win in Event #3 at Wildhorse. He jumps in at #1275 on the Pacific Northwest Poker Leaderboard. James Austin [#1280] of Mill Creek, Washington only had a couple of cashes under his belt before winning the first event at Wildhorse; Matt Johnson from Richland took 2nd for his first recorded cash (but there’s another Matt Johnson from the suspiciously nearby Tri-Cities with six Pendleton cashes since 2010, not to mention a Matt Johnson from Kennewick with five). Yakima’s Ronnie Anderson won the Thursday event at Wildhorse for a first Hendon Mob cash, ditto for Boise’s Ron Rausch in the Seniors tournament on Wednesday. They’re 1463 and 1480, respectively, on the PNW Leaderboard. James Han of Beaverton got his first and second Hendon Mob cashes at Wildhorse this series, with 4th place in the Friday tournament and 22nd in the Main Event. Seattle’s Dylan Wilkerson has been on a roll the past month, with 7 cashes including a win, four final tables, and an unofficial final table appearance. He started off with a 10th-place finish at the WSOPC Las Vegas Main Event (610 entries), then 8th in the High Roller at the same series (109 entries). Hopping out to the Seminole Hard Rock Poker Showdown, he placed 8th in the Bounty tournament (#10, 145 entries) and the 8-Max (#11, 170 entries) and the Turbo (#13, 93 entries), slipping in a 24th place in the $3M GTD WPT Showdown Championship (1,309 entries). Then he swung up to North Carolina to win the 1,060-entry WSOPC Cherokee Main Event. And on the 21st He Rested. Well, probably he played poker, but he hasn’t cashed in another tracked tournament for a whole week. For all that work, Wilkerson moves up three spots on the leaderboard to 8th. The biggest jump—percentage-wise—this month is from the single cash by Scott Powrie from Bothell, who goes from #1,062 to #296 by taking 4th place at the WSOPC Las Vegas Main Event. His nearest contender for “Most Improved Ranking” is Colton, Washington’s Richard Jutte, who won the Friday tournament at Wildhorse (moving from #2,671 to #754: more places on the leaderboard but slightly smaller percentage). Toledo, Oregon’s Tony Shearer (#1182, 3rd in the Wildhorse Friday tournament) and Robert Haerling of North Powder (#1244, 2nd in Wildhorse Event #3) both moved up by more than 50%. Bob Schulhauser of Spokane gets the credit for the win of the Wildhorse Main Event in the record books, but blog selfie mascot Elizabeth Tedder and friend of the blog Clarke Straus were in on the deal (now #150 and #233). Clarke noted Kristy Becker of Alaska deserved mention (though I don’t track Alaska) as it’s still rare for two of the final four players in a large tournament to be women. Binh “Jimmy” Nguyen came in 5th, moving him up to #78. Chopped 3 ways for $32k. Now playing for $1k more and the Pendleton bracelet. Bob Petty from Richland didn’t have a single score that would have gotten him on the leaderboard round-up this month, but he had two 4th-place finishes at Wildhorse in Event #1 and the Seniors tournament that did the trick. He was the next guy out after me in last fall’s Seniors tournament. Down in Las Vegas, Landon Brown pulled off a similar hat trick, stringing three cashes at Planet Hollywood’s WSOPC together , including getting heads-up for a ring in Event #3, and an unofficial final table in Event #6, along with a min-cash in the Main Event. Stephen Elliott from Richland moves from #750 to #473 with his win in the Wildhorse High Roller. The scheduled payouts in this event were incredibly steep, with 2nd place making barely half that of first; that was attained by Stephen Schumacher of Lewiston, who also took 3rd in the Turbo. He moves up to #459. Peter Lynn (#921, Olympia) came in 5th in the Run it Up Reno Main Event. Thomas Kornechuk of Auburn moved up more than 250 places to #605 with a 55th-place showing at the WPT Showdown Championship. Enrique Curiel’s 3rd place at the Wildhorse Event #10 was enough to move the Pasco resident up to #798. Another player with more than 20% rise in rank was Ryan Stoker of Spokane, whose 10-place finish at the now-notorious HPT Las Vegas Main Event bumped him up from #843 to #651 (the venue and/or organizers—facing an overlay—allowed some players to register late at half price). I traded pendy for a hpt FT in Vegas. Bittersweet but there is always November ! Calvin Lee (#78, mercer Island) eschewed the US entirely. His last three cashes have been in Korea, with two this month at the Asia Pacific Poker Tour, taking 54th in the Main Event and 8th in the High Roller. David Mallet of Point Roberts, Washington won the 15-entry HPT Las Vegas Event #2 on Aprll Fool’s Day before wandering his way north to Pendleton. Along the way, he stopped off for the WPTDeepstacks Thunder Valley Main Event for a min-cash, then once he got to town he took 14th in the Wildhorse Seniors tournament and 9th the next day in Thursday’s game. That all pputs him in #406 on the leaderboard. John Stephenson from Yelm hasn’t had a recorded cash since 2014, but he’s come roaring back with a win in WSOPC Cherokee Event #12 that puts him at #138. Talking Stick in Arizona is one of the places that records actual payouts in the cvase of a deal, and Mercer Island’s Michael Corson was in a 3-way deal for the Getaway Classic. Daniel park skips in under the tent with 18th place at the WSOPC Las Vegas Main Event, moving up to #213. Dylan Linde took 10th in the SHRPO Big Stack, but it doesn’t budge him on the leader board (#16) because the differences between players at that level aren’t affected by your average cash. Likewise, Darren Rabinowitz (#14) doesn’t move even with three four-figire cashes at WSOPC Las Vegas Main Event (40th place) a final table in the SHRPO Bounty, and a min-cash in the SHRPO Main Event. Then there’s Kao Saechao. He went down a spot to #57, but he shouldn’t even be on the list this month because I’m pretty sure he wasn’t even in Pendleton. He has three cashes at Wildhorse attributed to him (30th in Friday’s Event #11, and wins in Big O and O8, but I’m think those are supposed to be under Kao “Flexx” Saechao from Seattle, who was at my table for he High Roller. What leaderboard report would be complete without some Maxwell Young news? He dragged in a first-place prize at the Mid-States Poker Tour Black Hawk Main Event stop that was his third-largest to date. He’s reached the point where the kind of thing that woul propell someone else up into the top10% of the leaderboard moves him…2 spots, to #37. Another well deserved win for Max Young (@Mawkswell). He topped a field of 469 entries to win the latest MSPT @gates_poker Main Event for $97,810! He's got a tremendously bright future in this game. Max has got to be looking over his shoulder now for Almedin Imsirovic. The Vancouver native was interviewed in the April 25 issue of CardPlayer magazine’s “When I was a Donk” feature (not yet available online), then promptly won the Borgata Poker Open Main Event. He’s sitting in position #38, right behind Max. There are currently 3,435 players in my database (which may include some duplicates as noted before). 32% of the players are from Oregon. 59% of the players are from Washington. 9% of the players are from Idaho. The numbers of players in the database are roughly relative to the populations of the states, with Idaho picking up a few percentage points vs Washington. There are 6 poker millionaires on the Oregon leaderboard, though at least half of them no longer actually live here. Kevin MacPhee and Dylan Linde are the Idaho poker millionaires. Washington has 16 poker millionaires on the leaderboard. Poker millionaires make up less then 0.7% of the player the leaderboard tracks. There are 28 players with less than $1M and more than $500K in lifetime earnings on the leaderboard (0.8%). 48 players fall into the range between $250K and $500K in lifetime earnings (1.4%). Players with more than $100K but less than $250K make up 4.25% of the players. Players with lifetime earnings of $100K or more account for just over 7% of the group I track (those with $3K or more in lifetime winnings). 66% of the players tracked (those with more than $3K) have less than $20K in lifetime earnings. and 15.8% were between $20K and $40K.